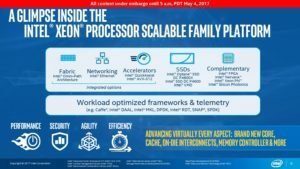 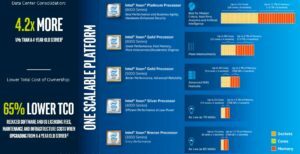 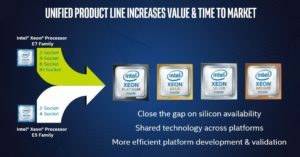 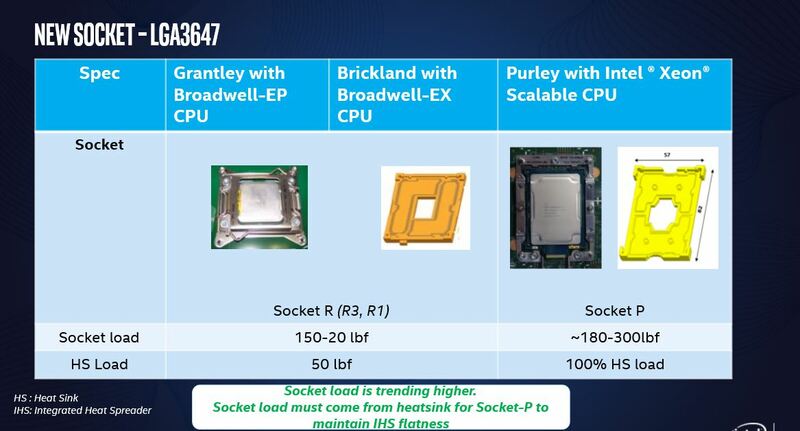 Intel says that the Xeon Scalable Processor line is the largest upgrade in server CPU’s in a decade. 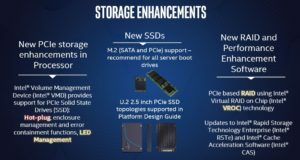 Lets take a very quick run through of what has changed and then you can make up your own mind. 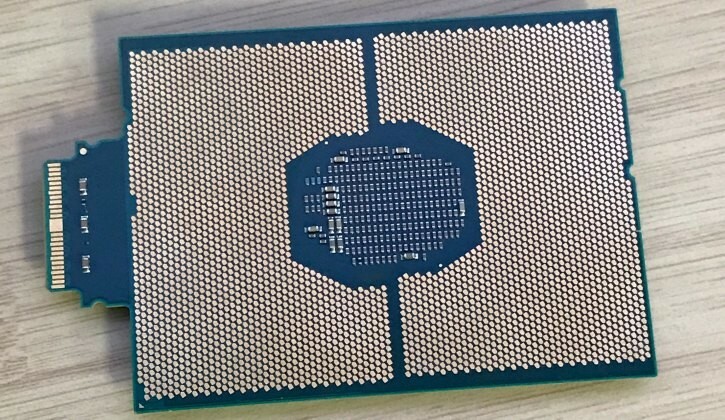 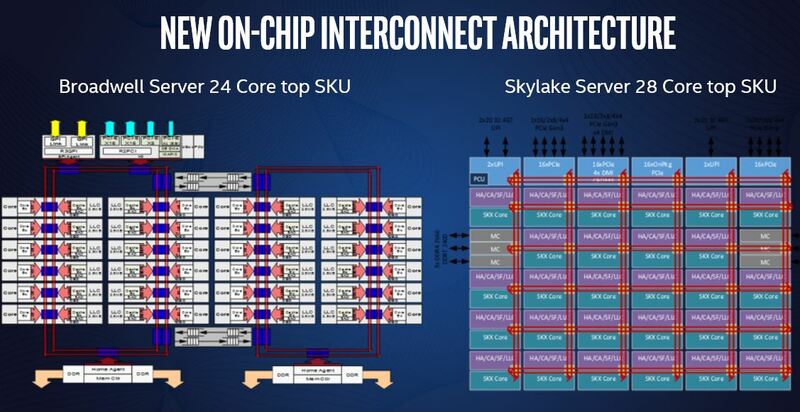 The new CPU’s are code named Skylake and the new Chipset required to support them is named Lewisburg. 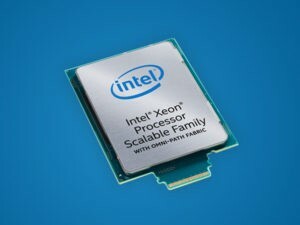 Intel has scrapped its old naming convention that was in lock step with the Intel Core Series CPU’s and renamed their server line to Xeon Scalable Processors. 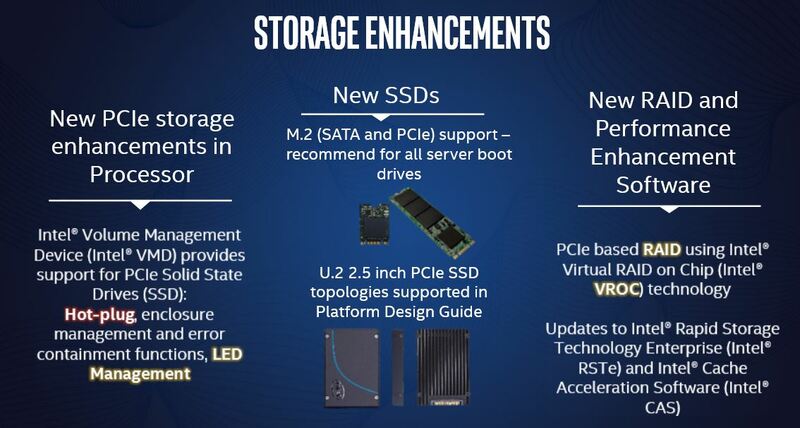 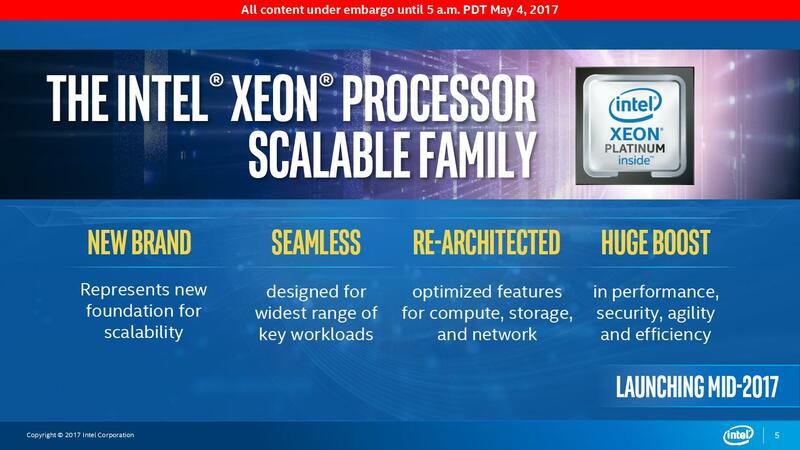 They are pitching this change as a merging of the old E7 Xeons with the E3 Xeons, but from where I stand, it is a splitting of the brand. There are now FOUR lines to keep track of, Bronze, Silver, Gold and Platinum. 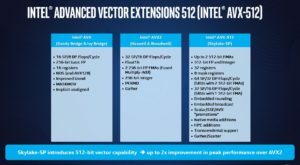 In addition to the expected performance differences, those new brands also reflect the pricing. 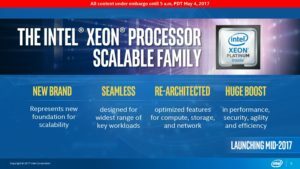 The top Intel® Xeon® Platinum 8180M Processor has a massive 28 cores with huge 38MB of Cache at an earth shattering price of USD $13011. 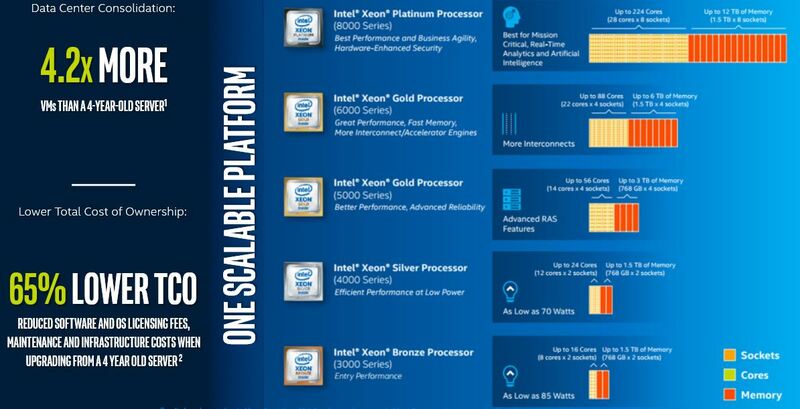 At the other end of the spectrum is the Intel® Xeon® Bronze 3104 Processor with just 6 cores, 8MB of cache at bargain basement price of just USD$213. 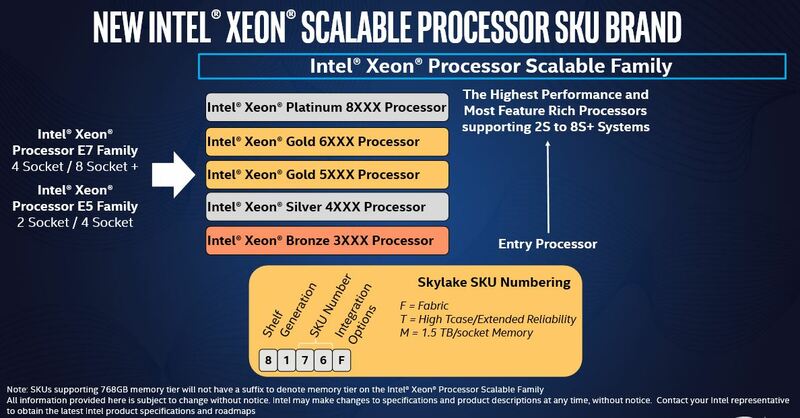 If you just skim the numbers it will appear that CPU cache has been REDUCED on the new Xeon SP’s. 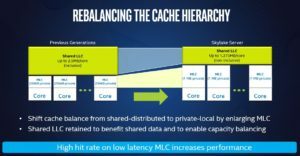 The truth is that the SHARED memory cache has been reduced because each core now has FOUR TIMES the amount of DEDICATED memory cache. 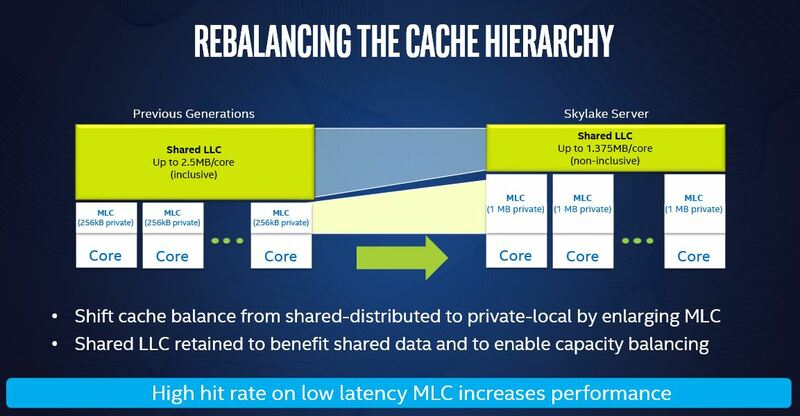 This can have an enormous performance difference. 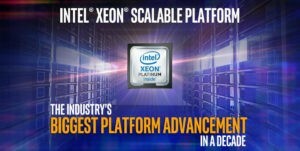 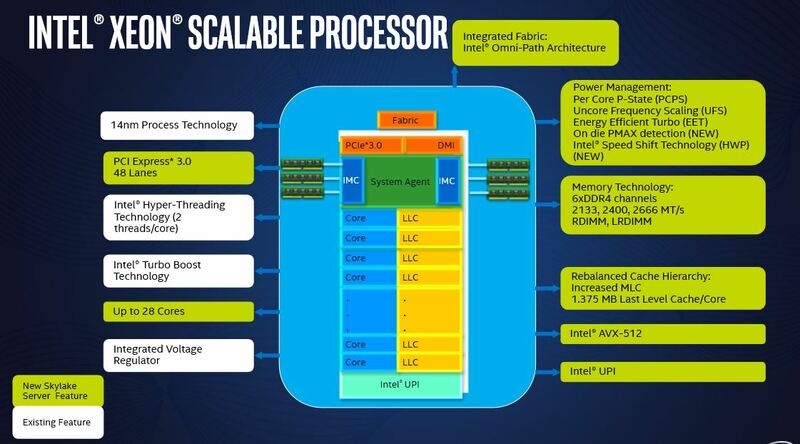 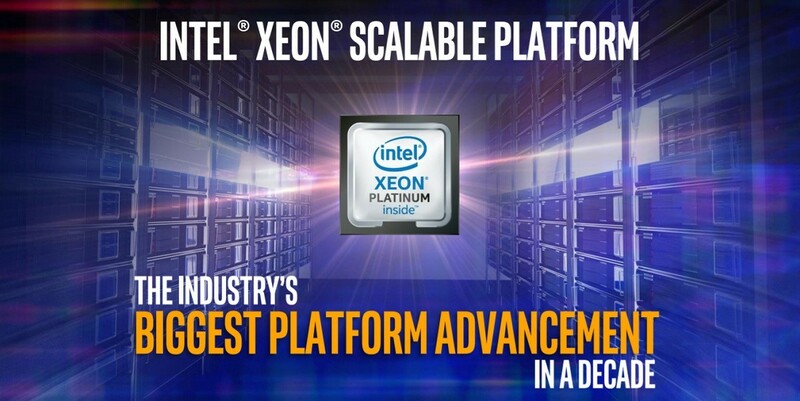 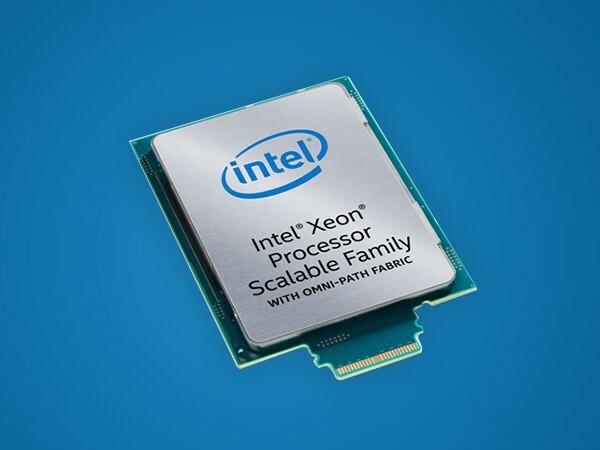 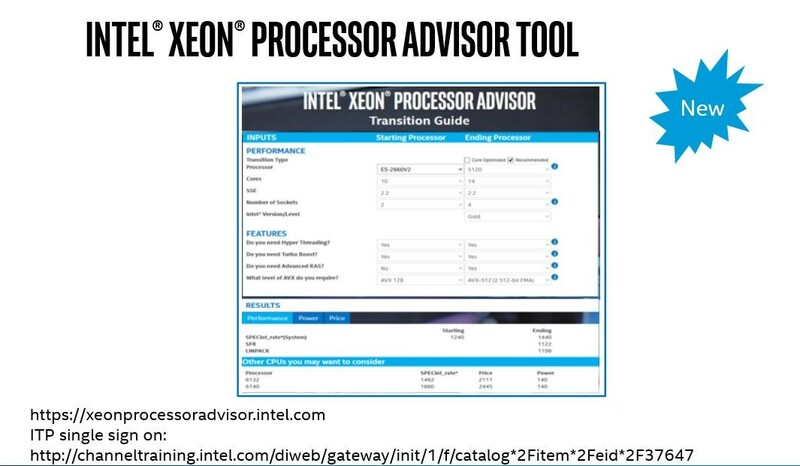 Previous Xeon’s used two ring buses to move information around between cores and core-caches but the new Xeon Scalable Processor uses a full mesh the call QuickPath Interconnect (QPI). 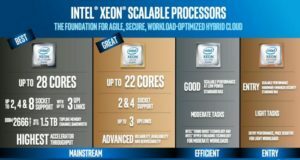 The old ring bus just will not work efficiently with the number of cores Xeon’s are shipping with these days. This means Xeon SP’s can efficiently move bits between cores. 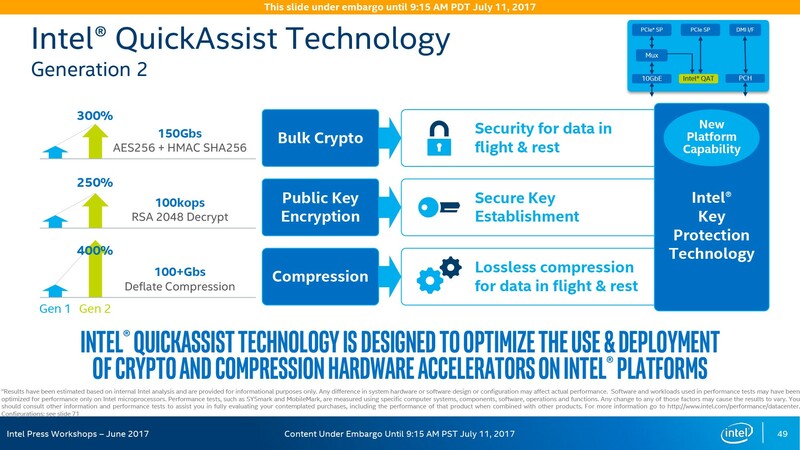 Ethernet, Fabric and Intel Quick Assist can now be integrated into the CPU. 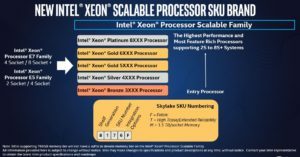 Note that you need to read the SKU details to ensure you are getting the right feature set. 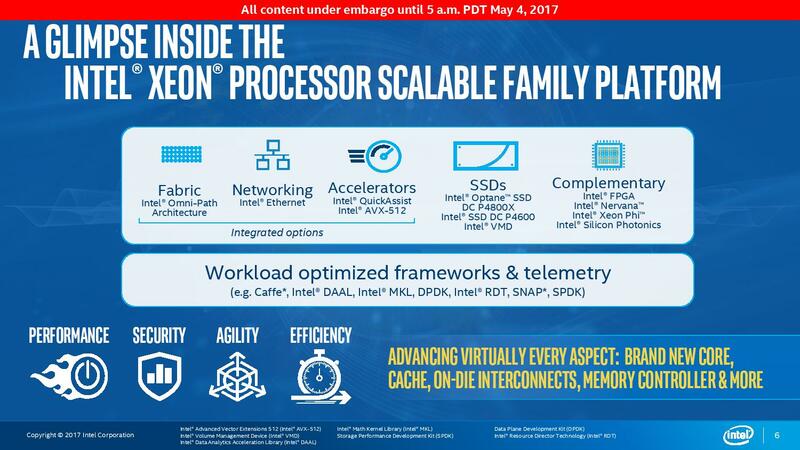 All Xeon SP’s do NOT have these features. 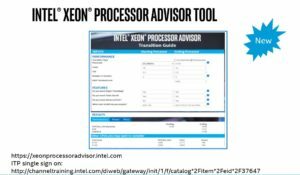 AVX-512 is a set of special purpose foundational instructions that are used heavily in high performance computing environments like Artificial Intelligence, Cryptocurrency Mining, Audio / Video Encoding and even development tools like Visual Studio 2017 . We have a whole write-up on AVX512 you might like to read. 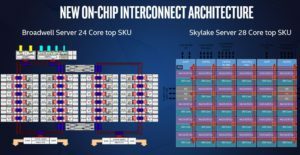 The number of PCI Express lanes increases from 40 to 48. 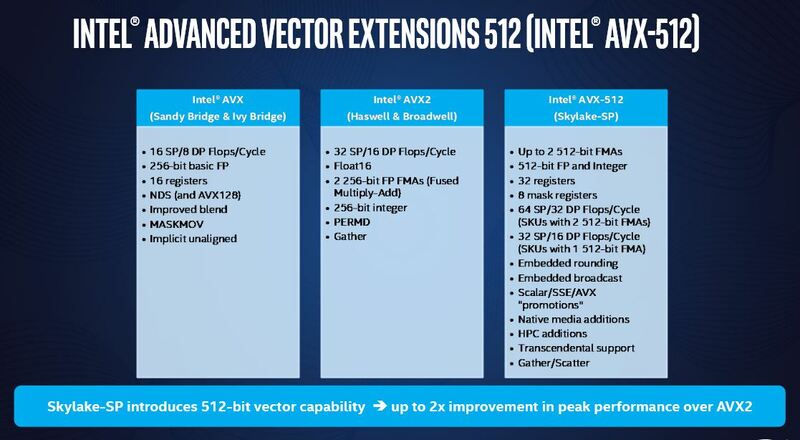 SOLVED: What is Intel AVX-512?